The survival of the world’s rhinos is being seriously threatened by poaching for their horns, driven by demand in Vietnam and China. Of the five rhino species, three (black, Sumatran and Javan) are listed as Critically Endangered on the IUCN Red List, while the white rhino is listed as Near Threatened. The greater one-horned rhino of India and Nepal is listed as Vulnerable but, with a fragmented population of approximately 3,500, they are at considerable risk. 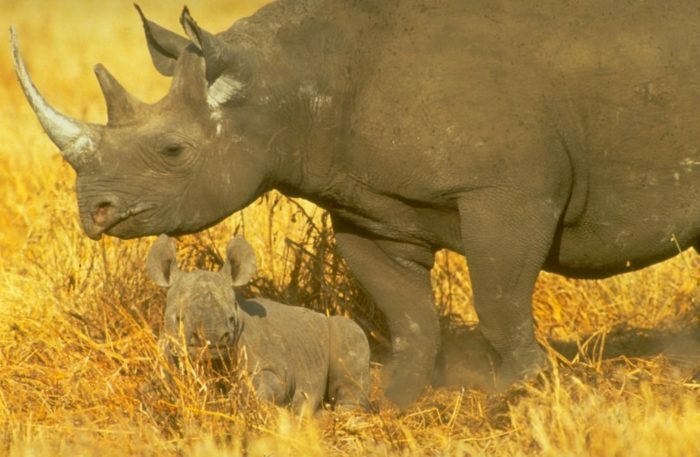 The past decade has seen a dramatic escalation in rhino poaching. In South Africa, home to about 90 per cent of the world’s white rhinos, more than 1,000 have been poached every year since 2013, up from just 13 in 2007. The situation for rhinos in Asia is even more critical – 151 greater one-horned rhinos were poached in India in 2010-15 and, with fewer than 80 Sumatran and about 67 Javan rhinos surviving in Indonesia, these species are teetering on the brink of extinction. Horn trafficking is undertaken by transnational organised crime networks, many of which are involved in other large-scale criminal activities, including trade in ivory, pangolins and big cats. Our interactive map provides a glimpse into the illegal rhino horn trade since 2006. It includes incidents of seizures and thefts of rhino horn, along with convictions relating to the rhino horn trade, in turn demonstrating the inadequate rate of convictions. Data has been collected from publicly available information, including government reports, enforcement agency press releases and non-governmental and academic papers, along with news media in several languages, but is not an exhaustive data set and likely represents only a fraction of actual activity between 2006-17. We would like to thank TRAFFIC for additional cases included in this dataset. This map was last updated in September 2018. The yellow markers represent a total of 583 seizures of rhino horn, involving approximately 4,927kg, equivalent to about 1,770 individual horns. Where the weight of rhino horn seized has not been reported (i.e. only a specific number of horns have been reported), we have calculated the weight of the seizure by using an average weight of 2.78kg per horn, except where the location of the seizure strongly suggests the horn is from an Asian rhino species, where a figure of 0.96kg is used. Based on the seizures in our data set, the countries in which the greatest amount of horn have been seized since 2006 are South Africa (1,659kg), China (including Hong Kong) (779kg), Vietnam (608kg), Mozambique (451kg) and Namibia (188kg) and Malaysia (167kg) and Thailand (136kg). In addition, 58 seizure incidents are noted in India and 28 in Nepal, where the weight of horn seized tends to be lower due to the smaller horn of the greater one-horned rhino. The blue markers represent thefts of rhino horn, including thefts from government stockpiles, private homes and museums. These incidents involve the theft of at least 339 rhino horns, which were likely trafficked into the black market. In particular, a spate of thefts in Europe in 2010-12 has been linked to organised criminal networks. The green markers, 153 cases in total, represent convictions relating to selling or purchasing rhino horn, theft of rhino horn, or individuals found in possession of horn. The map does not include convictions relating to poaching unless a seizure of rhino horn also took place. While this data set is not exhaustive, it is nonetheless striking to note how few seizures have been openly reported as resulting in convictions, particularly in Vietnam, Mozambique and India, and we encourage governments to publish the outcome of prosecutions. Demand for rhino horn comes primarily from China and Vietnam, where it is used as a material for carving cups and trinkets, ground up for use as a hangover cure, party drug or in traditional medicine (despite it having no medicinal value) or is displayed whole as a status symbol. The map indicates the extent to which Chinese and Vietnamese nationals have been heavily involved in the global rhino trade. Cases which demonstrate Chinese or Vietnamese involvement are circled in red and black respectively; involvement being defined as occurring in China or Vietnam, or the source explicitly stating that a national of that country was arrested, convicted or found in possession of rhino horn. Overall, our records document the seizure of 1,320kg of rhino horn explicitly linked to Chinese nationals (26.8 per cent of total seizures) and 1,235kg of rhino horn explicitly linked to Vietnamese nationals (25 per cent of total seizures). Chinese nationals have been arrested in possession of rhino horn throughout Africa, Asia and Europe, with a particular proliferation of cases in South Africa in recent years. Vietnamese nationals have been arrested in various African countries, as well as in transit and destination countries such as Qatar, the Czech Republic, Thailand, Singapore and China. There is an urgent need to end all demand for rhino horn in China, Vietnam and other countries, and this goal can be achieved only if laws and policies that clearly prohibit all trade in rhino horn are effectively enforced. The global nature of the rhino horn trade highlighted by this map also emphasises the importance of regional and international cooperation between enforcement agencies to tackle this serious transnational crime. We welcome referenced information to update the map and the dataset is available for research and analysis on request. Please contact us.